A team of SAS Data Integration Studio users wants to work simultaneously with a set of related metadata. They want to avoid overwriting each other's changes. Have an administrator set up a change-managed folder in the Folders tree, such as the Data Collection 2 (CM) folder shown in the following display. Under change management, most users are restricted from adding or updating the metadata in a change-managed folder in the Folders tree. Authorized users, however, can add new metadata objects and check them in to the change-managed folder. They can also check out metadata objects from the change-managed folder in order to update them. The objects are locked so that no one else can update them as long as the objects are checked out. When the users are ready, they check in the objects to the change-managed folder, and the lock is released. If you are authorized to work in a change-managed folder, a Checkouts tree is added to your desktop in SAS Data Integration Studio. The Checkouts tree displays metadata in your project repository, which is an individual work area or playpen. To update a metadata object in the change-managed folder, check out the object. The object is locked in the change-managed folder, and a copy is placed in the Checkouts tree. Metadata that has been checked out for update has a check mark beside it, such as the first two objects in the following display. You can modify the copy in the Checkouts tree. When ready, check in the updated object to the change-managed folder. Any lock on that object is released and any updates are applied. To add a new metadata object to the change-managed folder, add the object as usual. The metadata is added to the Checkouts tree. New metadata objects that have never been checked in do not have a check mark beside them, such as the last two objects in the preceding display. When ready, check in the new object to the change-managed folder. Note: Users who are working under change management should not use My Folder in the Folders tree. They should use the Checkouts tree and the change-managed folder instead. For, example, when you add a new metadata object, verify that the folder path in the Location field for the object goes to the appropriate, change-managed folder. For information about setting up change management, administrators should see the “Administering SAS Data Integration Studio” chapter of the SAS Intelligence Platform Desktop Application Administration Guide. See also Usage Notes for Change Management. Click Next, and enter a machine address, port, user name, and password that enable you to connect to the appropriate SAS Metadata Server. Click Next. The wizard attempts to connect to the metadata server. If the connection is successful, the Project Selection page displays. Select the appropriate project. Then select the Connect to a project check box. Click Finish to exit the connection profile wizard, connect to the metadata server, and display the server's metadata in SAS Data Integration Studio. The name of your project repository is displayed in the Checkouts tree on the desktop. In order to perform tasks such as these, you must use a connection profile that has appropriate privileges in the change-managed folder. Ask an administrator for a logon ID and password that has the privileges that you need for these tasks. Then create and use the connection profile as usual. If you have not done so already, open a connection profile that enables you to work with the metadata in a change-managed folder. Add the metadata as usual. Verify that the folder path in the Location field for the object goes to the appropriate, change-managed folder. To specify a different path in the Folders tree, click Browse and select the desired path. The new object appears in the Checkouts tree on the desktop. The new object is not displayed in other trees until it is checked in for the first time. When you are finished working with the new metadata, you can check it in to the change-managed folder. 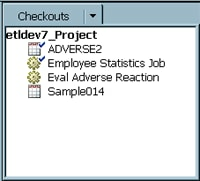 To check in selected objects, select one or more objects in the Checkouts tree, right-click them, and select Check In. The Check In Wizard displays. Alternatively, to check in all metadata in your project, right-click the name of the project in the Checkouts tree, and select Check In All. The Check In Wizard displays. In the Check In Wizard, enter a title and an optional description for the changes that you are about to check in. The text entered here becomes part of the history for all objects that you are checking in. If you do not enter meaningful comments, the history is less useful. When you are finished describing your changes, click Next. The Select Objects to Check In page displays. You can use the Select Objects to Check In page to identify any checked-out objects that depend on an object that you selected for check-in. For example, suppose that you had checked out a job and also a table that was in the process flow for that job. If you selected the job for check-in, the Select Objects to Check In page would indicate that a table in that job was also checked out. In that case, you might want to check it in along with the job. To skip the Select Objects to Check In page, click Next to display the Finish window. Otherwise, select an object in the Select Objects to Check In page. Any checked-out objects that depend on the object that you just selected are displayed on the Dependencies tab. Use the Dependencies and other tabs on this page to determine whether you want to check in a dependent object along with the parent object. When finished, click Next to display the Finish window. Review the metadata and click Finish to check in the metadata. After check in, any new or updated metadata that was in your Checkouts tree is moved to the change-managed folder. In the change-managed folder, right-click the metadata that you want to check out and select Check Out. Alternatively, you can left-click the metadata that you want to check out, and then go the menu bar and select Check Outs Check Out. The metadata is checked out and displays in your Checkouts tree. After you are finished working with the metadata, you can check it in to the change-managed folder. You can use the Delete option to permanently remove selected metadata objects from the metadata server. Metadata objects that have never been checked in are simply deleted from the Checkouts tree. Metadata objects that are checked out are deleted from the metadata server. Note: Metadata objects that are deleted cannot be recovered except by restoring the metadata repository from backup. Perform the following steps to permanently remove selected metadata objects. If the metadata objects that you want to delete are not checked out, check them out. In the Checkouts tree, select one or more objects that you want to permanently remove. Right-click the object or objects and select Delete. Click Yes when prompted to verify the Delete operation. In the Checkouts tree, select one or more checked-out objects whose changes should be discarded. Right-click the object or objects and select Undo Checkout. Click Yes when prompted to verify the undo check-out operation. Right-click the Checkouts tree and select Clear. Alternatively, you can select the name of your project in the Checkouts tree, and then select Checkouts Clear from the menu bar. Some problems require an administrator to clear all metadata from a user's project repository, which is the metadata repository that populates the Checkouts tree. For example, suppose a user checked out metadata objects but forgot to check them back in before going on a long vacation. In the meantime, other users need to update the checked-out metadata. As another example, suppose an administrator accidentally deletes a user's project repository that contains checked-out objects. These objects would remain locked and unavailable for update until they were unlocked. Start SAS Data Integration Studio. Select a connection profile for an unrestricted user, as described in Create a Connection Profile for an Administrator under Change Management. On the SAS Data Integration Studio desktop, select Checkouts Clear from the menu bar. The Clear Project Repository window displays. Unrestricted users see all project repositories on the current metadata server. If the project repository that you want to clear been deleted, select Search for deleted project repository information. Any deleted project repositories on the current metadata server are listed. In the Clear Project Repository window, select one or more project repositories to be cleared. Then, click OK. In the selected projects, all new objects are deleted, and all checked-out objects are unlocked. All changes that have not been checked in are lost. Under change management, you can neither add new cubes nor check out existing cubes for update. Under change management, there is limited support for the following types of objects: Stored Processes, Information Maps, Web Services, Deployed Jobs, Deployed Flows, Mining Results, Reports, and Prompts. You can add these objects and check them in once. You can import these objects and check them in once. However, some actions might not be supported for these objects.